When I was 18, I took my first trip to Italy. 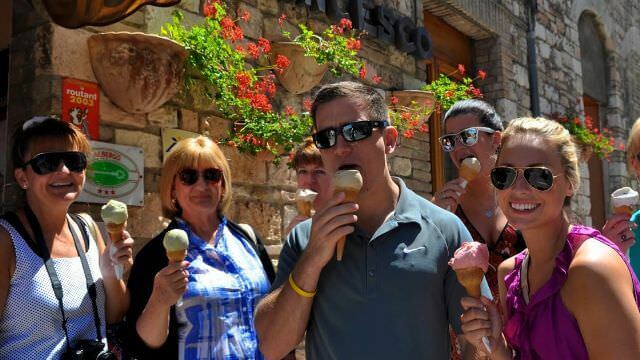 It was not your traditional trip to Italy! My dear high school friend, Rocco, had moved there to live with his family, so the morning after I landed in Rome, I immediately went to visit my friend. That actually meant another flight to the tip of the boot (Reggio Calabria), then 2 1/2 hours on a rickety old train to a tiny little village in what seemed to be the middle of nowhere. A little town called Gioiosa Ionica. On the train ride, I met a couple of Rocco's friends, and although I didn't speak the language, we were able to communicate. I was Rocco's friend, so I was instantly their friend, too. One of them loved that my name was Michael, so wanted to play Michael Jackson songs on his Walkman. Once off the train, we got in an old Fiat and drove to Rocco's house. He lived with his Nonna (grandmother). Now, when I say "house," let me explain. It was a small farm in the middle of town. Downstairs there was one room, which served at the kitchen, den, and Nonna's bedroom. Outside of the house, there was a single bathroom with no running water. Before going to the bathroom, we had to fill up buckets from another outdoor sink that did have running water in order to shower or flush the toilet. All around us were chickens and a very nosy goat. Over to the side you could always find Rocco's uncle "Peppe" just chilling out on a makeshift porch, sipping his home-made wine and smoking. Just behind the bathroom, there was a rickety staircase that led up to what I learned was the room Rocco and I would be sleeping in. It was technically a covered room, but I was just waiting for the roof to cave in as the noise of termites eating the wood would keep me up at night. Staying there, I was simply part of the family. Nonna would cook for us every day, and made enough food to feed the village! Every time I would sit down to eat, I was in a catch 22 situation. Nonna would make the most amazing food, but there was no way to please her. Apparently I had never had any decent food, and I needed to put some weight on. So when she would give me a bowl of pasta that would normally feed five people, I would eat as much as I could, but then tried to tel her I was full. Huge mistake, because that was Nonna's key to start crying. All I remember her saying was "Mangia Mangia Mangia", and when I thought I had finally won the battle after breaking her heart, she would bring out the next course, and it all started over again. I quickly learned that it was virtually impossible to have a meal without Nonna bringing herself to tears, thinking I didn't like her food. But I did all I could, and ate everything I could without losing it. I was there for a couple weeks, and had the time of my life! I had really gotten to love those chickens and the goat, too! I remember one day coming home from the beach for lunch, and prematurely asked what was for lunch. Just as Rocco was saying the word "chicken" I noticed that one of my chicken friends was missing, and there were feathers all over. I'm not gonna lie... it was hard to eat that day! I have dozens of stories from my time there that I will never forget. After I left Rocco's home town, I continued to visit the Italy I had grown up knowing about. I made it to the Amalfi Coast, Rome, Florence, etc. I saw all of the sights, and did all of the bucket list things we all wanna do when we go to Italy. It was all wonderful. But here is the thing... When I came home to Los Angeles, all of my friends were asking me about my trip. All I would talk about were stories from the two weeks in Rocco's hometown. They would get impatient. They would ask "Did you swim in the Blue Grotto?" Yeah, but let me tell you this other story about the chickens at Rocco's house. "Did you see the Colosseum?" Yeah, yeah... but let me tell you about the widow that lived around the corner from Rocco, and how we were supposed to scratch our crotches 13 times every time we passed her. "What was Florence like?". Oh, it was cool, but listen to this story about what happened one night we went to a beach club in Rocco's town. On and on... all I wanted to talk about was the "local living" experiences I had. Sure, I saw the sights, but those real life experiences were the indelible memories I carry through life with me. On my next trip to Italy, naturally I went to Rocco's town again, but I also visited the town of Soriano nel Cimino, where a friend of my mother's lived. That is where I met Paola. Now, Soriano is in Central Italy, and I marveled at how compared to Rocco's town, Soriano was a marvel of modern civilization! Our "Villa" as it was "Back Then"
All of the houses had exterior walls, indoor plumbing with toilets that flushed, and so much more! But even there, I got a taste of something that I never knew would matter to me. Paola's parents lived in town, but also had an old country house (which is now our villa), on which they had a garden, some chickens and pigs. They would ask me to go get the eggs from the chickens, or I remember one night at dinner, I was in the kitchen, and Paola's mom taught me how to slice prosciutto. Such small things, but memories I will never forget. Every little thing I would experience of life in Italy, rather than "sights", just changed my perspective of, well... everything. And like the first trip, I went on to see more sights, but when I came home, all I wanted to talk about was how nasty those chickens were, or the wonderful people I met and befriended. None of my friends or family understood. I get it, because I wouldn't have understood either before that first trip. But those life experiences changed everything, while seeing the traditional sights were more like checking something off a list. As the end of the day, discovering the culture of Italy was what mattered to me. So when we started this company, the name Culture Discovery really fit, as our primary goal was to recreate moments similar to those I will never forget, for others. Our highest goal if you come on one of our vacations is that when you go home, your friends and family ask you about those famous sights that you may have seen, and you reply "Yeah, we saw that, but let me tell you about this other experience!"